When we first decided to skip the regular rescue show at the PetSmart and go touristing downtown, we felt a little guilty. How are we to get Gonzo Bunny-Ears adopted if we don’t give him any exposure? And yet, the cherry blossoms were calling. The weather oracle said it was going to be in the 60s and sunny, and the blossoms were at their peak. We decided we deserved it. To make ourselves feel less bad, I brought a bunch of Gonzo’s business cards (with our blog URL and the rescue’s info), decked him out in our cute “adopt me” vest, and loaded two dogs into the car. Well, we need not have worried. Mr. Gonzo Bunny Ears and brother Sir Loverboy Chick were such a hit that people were literally stopping us every ten steps to ask about them. Everybody loved Mr. 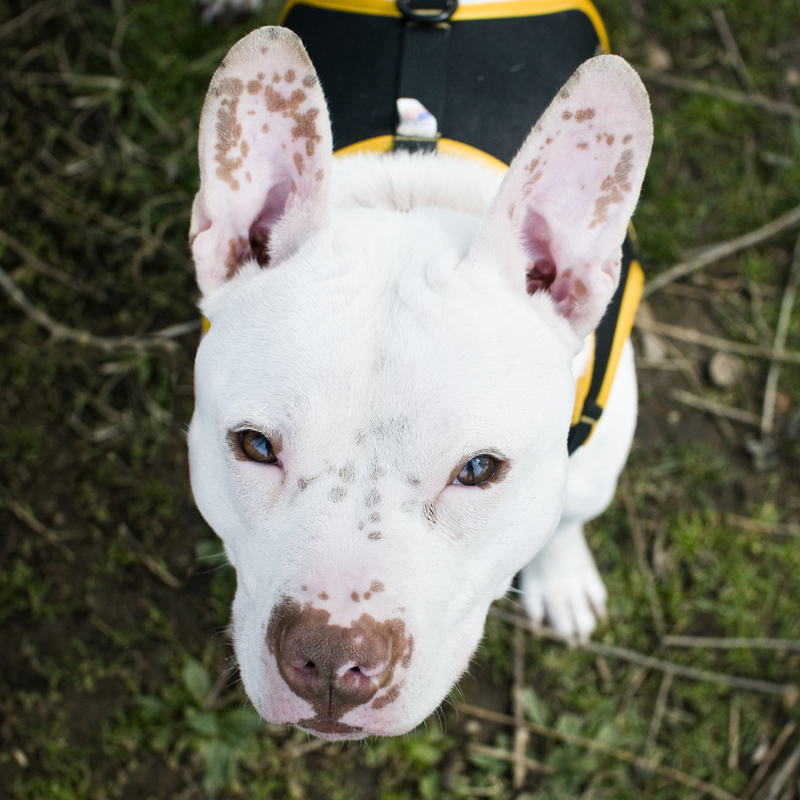 Ears in his vest, and a few people even wanted to adopt Sir Chick! The two dogs were petted by hundreds of hands, kissed by dozens of faces, and got to lick drool and baby food off the little fingers of several babies. 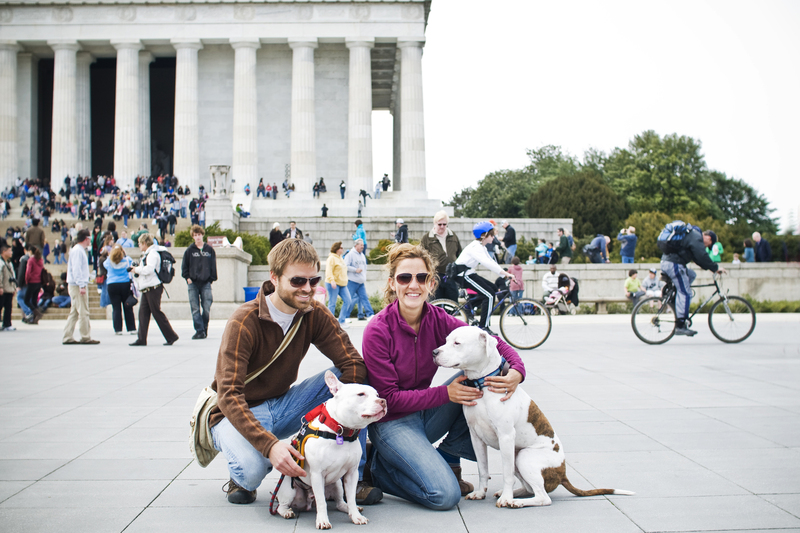 Several people took photos of the dogs — sometimes with their children, sometimes all on their own. 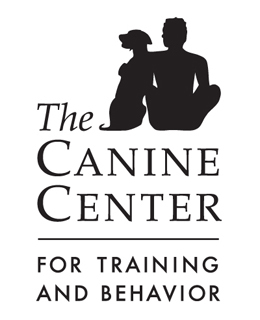 We were showered with compliments about our handsome and well-behaved dogs, and handed out business cards to a bunch of interested families. It was a blast! "Dad, what the heck is that about?" But mostly, we took in the classics. 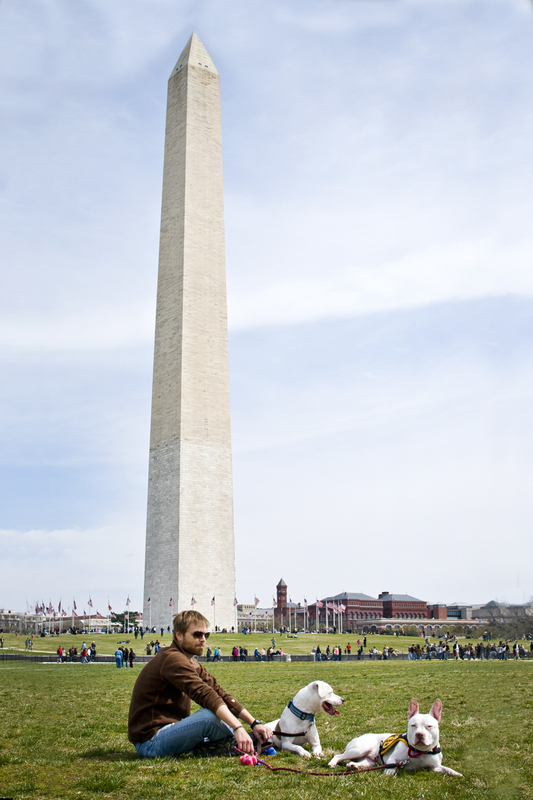 The National Mall, the Washington Monument, some climbing of cherry trees in bloom, admiring the flora, and the Lincoln Memorial. "part bunnyrabbit, dad, not part cat. sheesh!" "i dont know what those are, but i hope they don't bite..."
Gonzo and Chick were both so pooped by the end of our visit that they both actually layed down in the middle of the grass, amidst the crowds. This is otherwise unheard of for Mr. Ears, who only sleeps in dog beds and laps. Our visit to the heart of our nation’s fair capital made such an impression on Gonzo, that he has made a very important decision about his life. A decision that he will share with you all tomorrow. Is Gonzo running for office? He sure would look handsome wandering about the halls of congress. You got some beautiful shots! I would love to see DC this time of year…thanks for letting me see it in pictures! 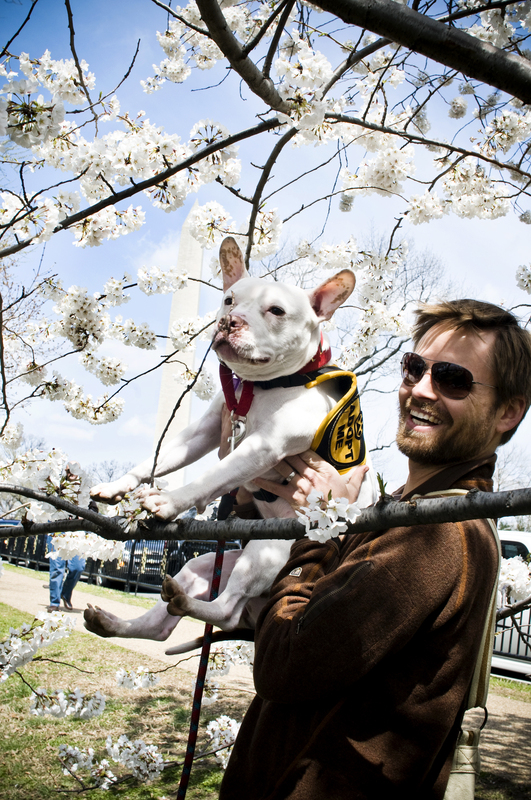 The cherry blossoms are even prettier this year with Gonzo and Chick next to them! Can’t wait to hear about his big decision tomorrow! Hmmm what is this decision?! I am intrigued. What a fun day! 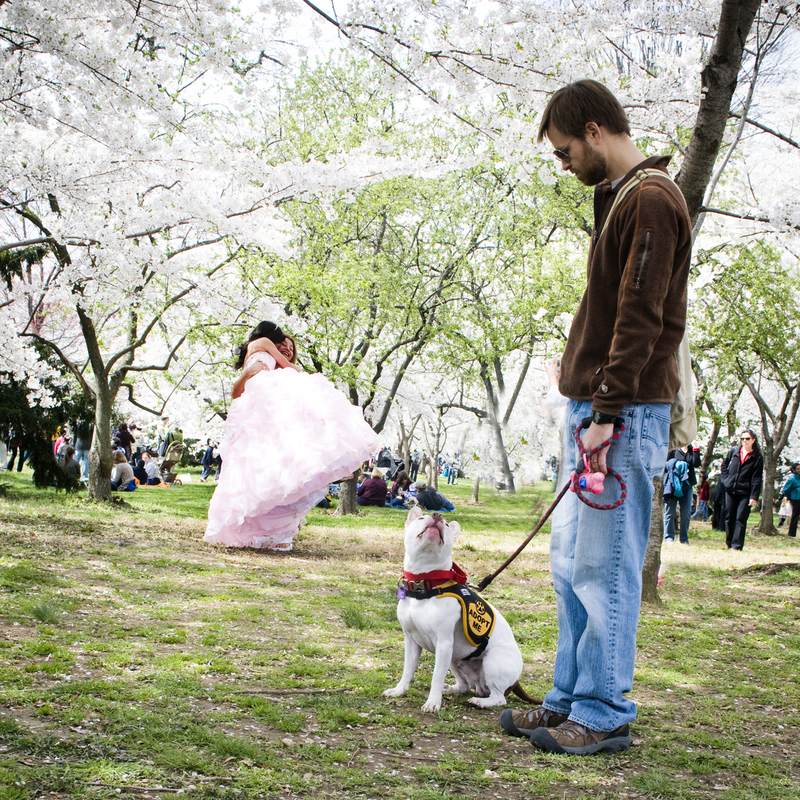 Pictures with dogs AND cherry blossoms = double winning. That’s so funny people wanted to adopt Chick! He’s such a handsome little dude. It seems like the two of them are really getting along. Im quite anxious to hear about Mr Gonzo Bunny Ear’s decision! EEEK! Such great pictures, I love cherry blossoms and seeing them on that backdrop is lovely! sounds like yall did a good thing missing out on the adoption event. I LOVE the weeping willow, those trees are awesome! Looks like yall had a wonderful day and awesome shots esp the family photo! Gonzo is really adorable! I just want to smooch his face! Where in the world did you get that adorable adopt-me jacket!! I would love to get one of those for my fosters when we are out and about! These pictures are fabulous and yet again Gonzo has stole my heart just like Lolly did! You guys do the best job sharing your fosters life with their adoring fans! Thanks Diane 🙂 The vest is available here: http://houndgear.net/. We have the medium, which seems to fit anywhere from Gonzo to Lollie (or bigger). It’s very sturdy, it’s adjustable, and gets us tons of attention!! hmmmmm…….he is going to lobby for PETA? He is going to urge people to cut down weeping willow trees? 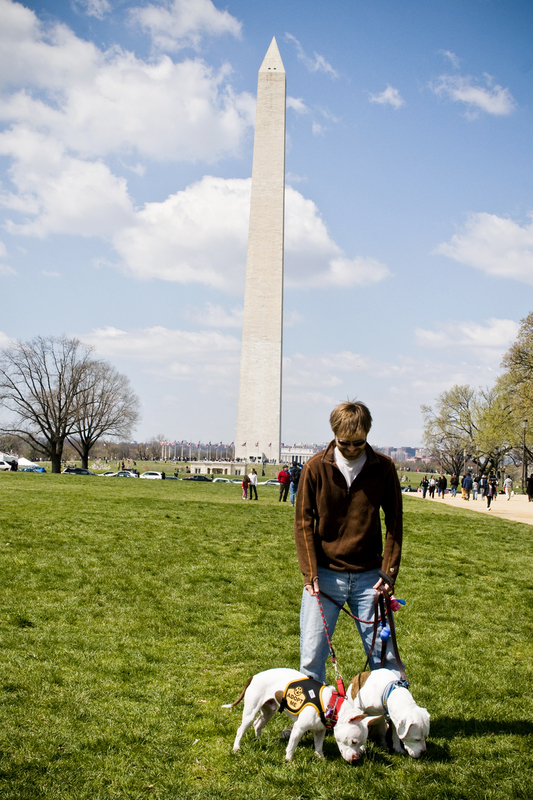 He is going to organize a million dog march? Gonzo is absolutely adorable, if I had more space I would totally adopt him!! He has the sweetest face! Kudos for taking the dogs downtown too. I have two Bostons, I think they would go bonkers down there. Great pictures and commentary too! What a great day! I can’t imagine that he wouldn’t be a huge hit. 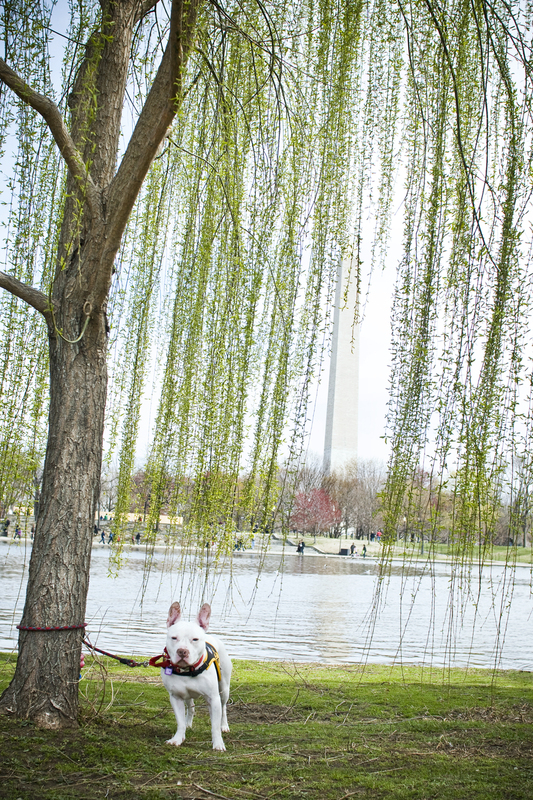 I did love seeing your DC photos; especially how his pink and white matches the blossoms. And that first photo of his freckled ears. Looks like such a fun day! I love that last photo in particular. 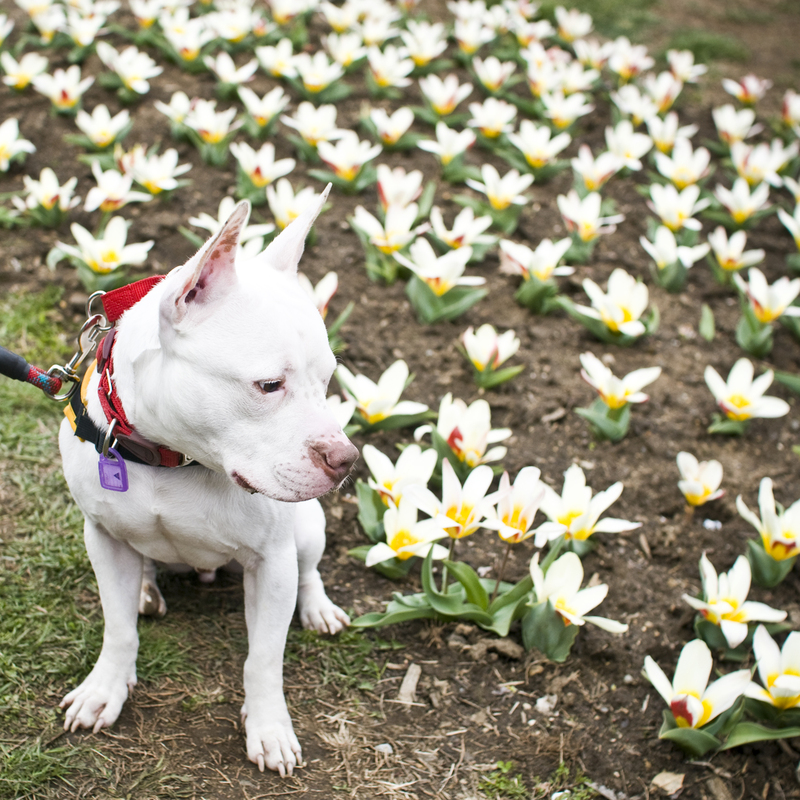 We love to take our dog to see the cherry blossoms, but sadly I think we’ll skip it this year… our new foster isn’t ready for such crowds of people just yet (too scary for him!). I think you gave Gonzo some wonderful exposure even if it wasn’t at PetSmart! As always, gorgeous photos! I love the business cards, too – such a great way to stay prepared. In addition to his ears, love Gonzo’s speckled nose! Great ambassador for all shelter dogs.